The Feathered Hook operates out of Star Valley, Wyoming, a community deep in the heart of the Greater Yellowstone Ecosystem that’s heralded for its exceptional fly fishing. Three trout rivers—the Snake, the Greys, and the Salt River—converge at the Palisades Reservoir in Alpine, Wyoming at the northern tip of the valley. Star Valley is wedged between vast tracts of public land: the Salt River and Wyoming Ranges to the east, the Snake River Range to the north, and Idaho’s Webster Range to the west. These mountains host some of the most abundant wildlife populations in the lower 48 states including elk, moose, whitetail deer, mule deer, black bears, trumpeter swans, ducks and geese. Wildlife viewing opportunities abound at any of the Feathered Hook properties. 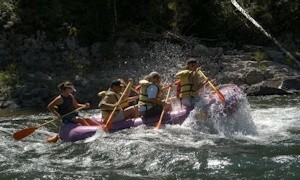 Jackson Hole and Grand Teton National Park are less than an hour’s drive north along the Snake River. 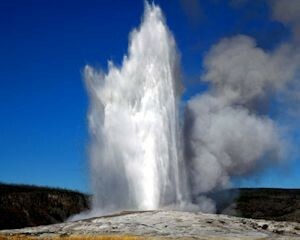 Yellowstone National Park lies just north of Grand Teton, about 95 miles from Alpine. The communities of Afton, Thayne, Etna and Alpine offer an array of dining options to cater to any palate. However, it’s the unspoiled natural beauty of Star Valley that makes it a world-class fly fishing destination. Early pioneers and environmentalists wanted to expand Yellowstone to include some the beautiful primitive areas surrounding its borders. Most of these ideas were defeated as extensions of Yellowstone. But the area south of Yellowstone, today known as Grand Teton National Park was established as a part of the original idea to expand Yellowstone. Also, thanks to John D. Rockefeller, the lands between Yellowstone and Grand Teton National Parks was purchased and given to us to help preserve this vast western wilderness. Wind River Mountain Range “The 90-mile long Wind River Mountain Range form the Continental Divide of the Rocky Mountains in Western Wyoming. These rugged and scenic mountains contain four wilderness areas and over 2,900 lakes and ponds. Wyoming’s highest mountain, Gannett Peak, is in this mountain range. Favorite destinations include Gannett Peak, Cirque of the Towers, Green River Lakes, Square Top Mountain and Photographer’s Point. Whether you’re going on a week-long pack trip or simply want to go for a day ride, Feathered Hook has the ability of taking clients on breathtaking rides through trusted outfitters. All scenic floats are guide-powered so you can relax and enjoy the scenery all around you. This 13-Mile stretch of braided river is home to an array of wildlife and is especially rich in bird life. 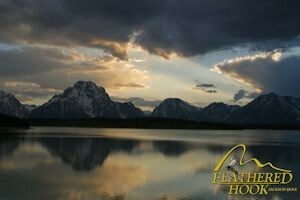 Join us in the morning, midday or late afternoon for a float with Grand Teton views and spectacular scenery. 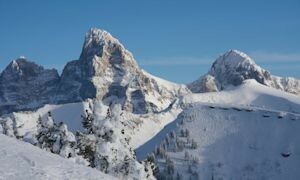 There are also other great ski resorts local to Feathered Hook locations. 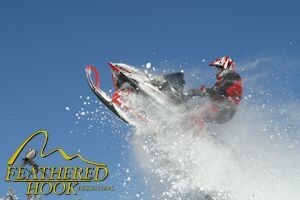 For those who love a good ride in the winter, this beautiful area offers incredible snowmobiling for all types of riders. Whether you enjoy trail rides, deep powder, hill climbing, etc…, we have it all! Not only will you have the opportunity to go on incredible riding adventures, but Jackson Hole is host of the World Championship Hill Climbs each winter, a show you won’t want to miss! Winter Fly Fishing Although fly fishing is known mainly for the incredible summer hatches, the winters with Feathered Hook offer fantastic opportunities for catching large trout on our Feathered Hook properties. The fly fishing opportunities in this beautiful area are year round. Whatever the conditions, fly fishing is a possibility on all of our properties.